I’m back from a little blog hiatus after the most amazing week at the beach. We stayed with friends at their family beach house on Cape Cod. It was a gorgeous week, we couldn’t have possibly been more lucky with the weather – nearly 6 straight days of sunshine! 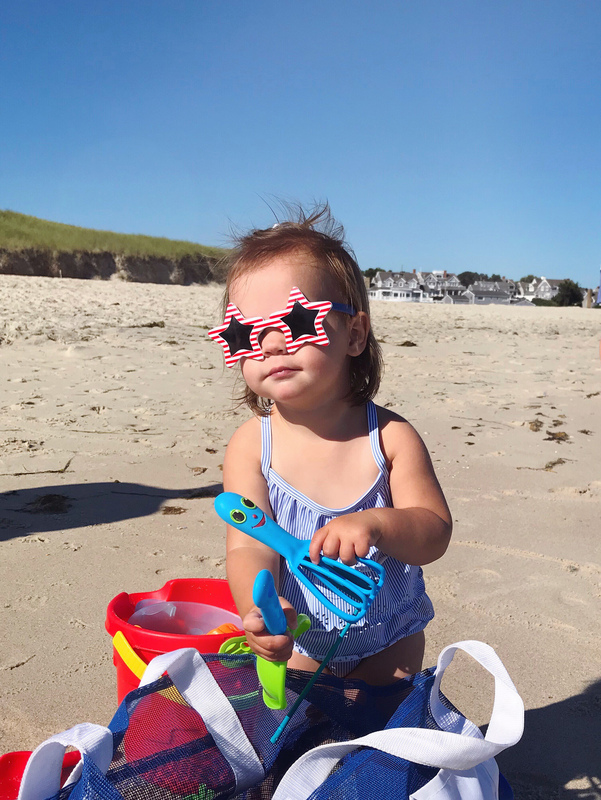 It was our first real family vacation and Jane took quite a liking to the beach – we collected seashells, dipped our toes in the water, and did lots of digging in the sand. 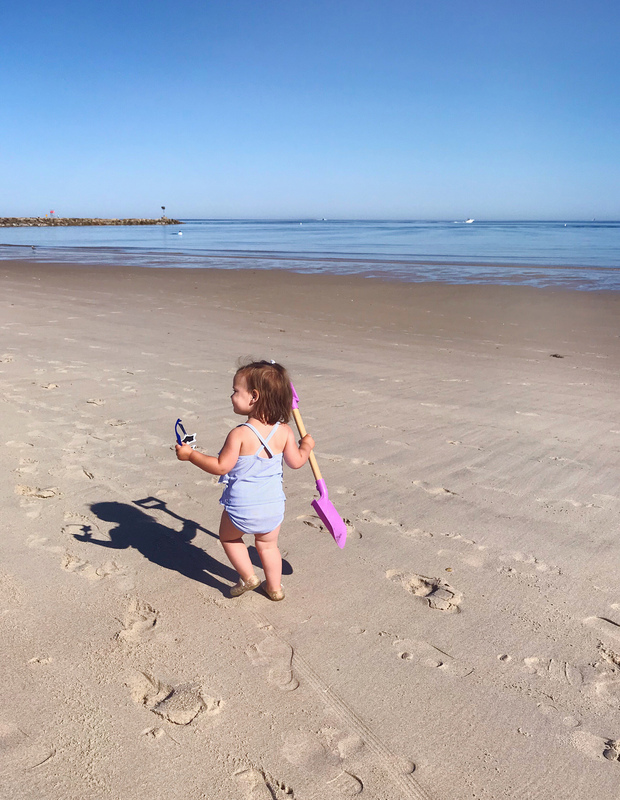 This was our first family vacation at the beach, so I found it to be a bit of a learning experience navigating it with a toddler. The first day we definitely over packed and lugged way too much stuff onto the beach. After that, we got down a much better system with a leaner set of beach gear. We have some great beach chairs that fold up into backpacks (and have really nice insulated pockets and holders for your phone and drinks). We couldn’t travel without beach toys of course and Jane’s favorite were these giant shovels that our friends brought (and the Dads found them pretty useful for digging sand castle holes too). We found that getting there in the early morning was ideal for optimal toddler happiness and packed them snacks and drinks to lure them in for some shade time under an umbrella. Our friends had these awesome water bottles that Jane because obsessed with – I had to order her one for when we got back home! And I got a cute bento-box style container for Jane’s lunch, which helped her keep her sandwich and snacks (somewhat) less sandy. Beach time in the morning resulted in some pretty awesome toddler naps in the afternoon – I actually managed to check a few books off my vacation reading list with at downtime! It felt like a real vacation, success! We also packed a few new toys for Jane and her buddy to keep them occupied and happy in the afternoons. Travel-sized magnadoodle boards were a winner with Jane, and so were the set of sea-animal toys that I brought. Our friends also brought a big book of reusable stickers that they spent time everyday sticking on the glass door to the porch! 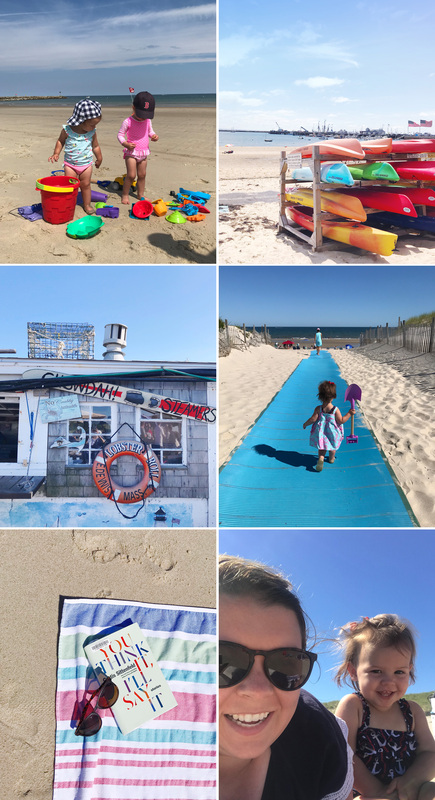 We weren’t without a few standard toddler meltdowns, but all in all, it was a pretty relaxing and successful first vacation with kids! The hardest part is getting back to reality – Jane started to cry when we were packing up the car to head back home. Adults felt the same way too, we need many more beach days in our future!